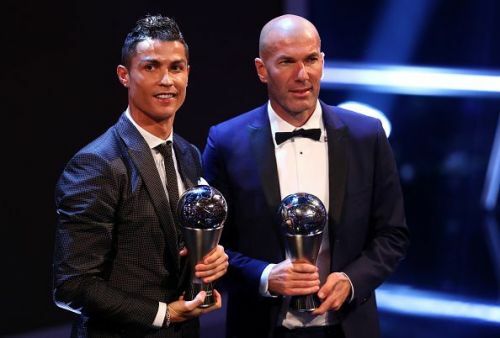 Re-appointed Real Madrid boss Zinedine Zidane has addressed the rumours linking Cristiano Ronaldo to a similar return to the Santiago Bernabeu following his sensational comeback to the club. In a surprising turn of events, Zinedine Zidane returned to Real Madrid, a mere ten months after leaving the European champions and has agreed to take over the club until 2022. The Frenchman said farewell to the Santiago Bernabeu last summer, after leading the club to their third consecutive Champions League trophy. His departure was followed by Ronaldo's shock transfer to Serie A giants Juventus. During his two-and-a-half year stint with Los Blancos, Zidane won three Champions League titles and one La Liga cup. Since his departure, and that of Cristiano Ronaldo's, Real Madrid have been struggling to replicate their usual form, suffering an array of defeats under Julen Lopetegui. Following a humiliating Clasico defeat to Barcelona, Lopetegui was sacked and Santiago Solari promptly took over. Under the Argentine, the team saw little improvement as they recently crashed out of two competitions- the Champions League and the Copa del Rey- before squandering their chances at a Liga title this season. Real Madrid president Florentino Perez made the announcement saying (via BBC), "The best manager in the world has rejoined the club. Our destinies are once again united." In an official unveiling ceremony on Monday, Zidane said, "It has been difficult from the outside looking in. I have been living here in Madrid, doing my things. But I have recharged my batteries. I'm ready to coach this great club again." Ronaldo, who is the club's all-time top scorer, was immediately linked with a return to Real Madrid following Zidane's re-appointment. When asked about a potential transfer for the five-time Ballon d'Or winner, the Frenchman said (via The Mirror UK), "That is not today's issue. We have 11 games to play, then we will see for next year. We all know Cristiano, one of the best players in this club's history." "But today is not for talking about these things. I am not thinking yet about that. The most important thing is to be back at the club, and I am just thinking now about these 11 games." "We will have time to look at the rest, with the appropriate people, then we will plan for next season." Real Madrid will hope to salvage whatever they can from the remaining La Liga games and will play their first game under Zidane on Saturday when they face Celta Vigo.